Are you looking for a holiday gift for your young child that doesn’t light up, make near-deafening noises or take the better part of Christmas day to put together? Why not try a book? 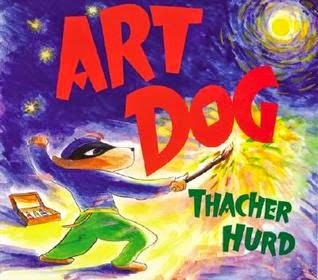 I’ve put together a list of my favorite art books for kids. These aren’t just books about art. Some of them include artistic concepts such as shapes and colors. These are easy reads with eye-catching illustrations that I’ve read about a zillion times (ok, that might be an exaggeration). But, they are some of my favorites from my son’s younger years. 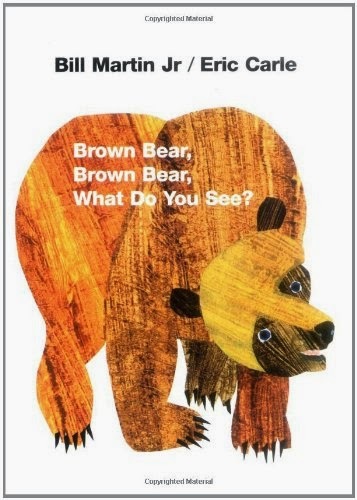 I’ve also read them, based all kinds of activities on them and used them as a way to view art (with the children who I’ve taught (without having to actually look at a painting hung on a wall). 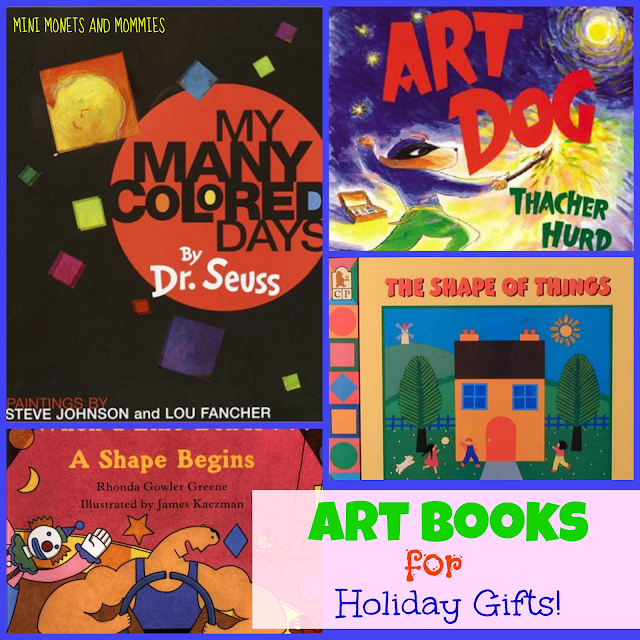 So, if you decide on one of these children’s books as a Christmas, Hanukkah or holiday gift for your toddler or preschooler, consider adding in an art activity too! That’s why I’ve provided super-simple crafts and artsy adventures that go along with each great read. Colors, animals and a cool collage style. Make a simple shape collage. Cut up construction paper into shapes, ask your child to name the colors and help her to puzzle together a collage animal with them. Love this! Let your pint-sized Picasso make a Matisse style collage using paper shapes and school glue. I used this with a group of preschoolers to make a mixed media color garden collage (yes, I do a lot of collages). 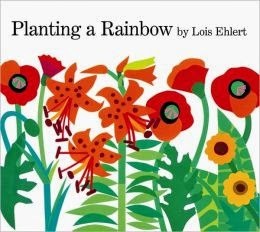 Try something similar to the Eric Carle animal collage, but with plant shapes. Add colorful tissue paper and even a few real seeds that your child can glue on. 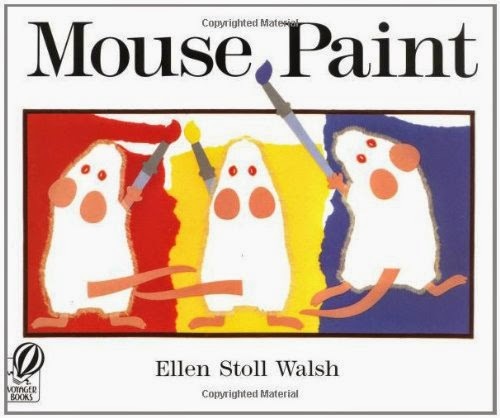 Paint like a mouse! Ok, maybe not. 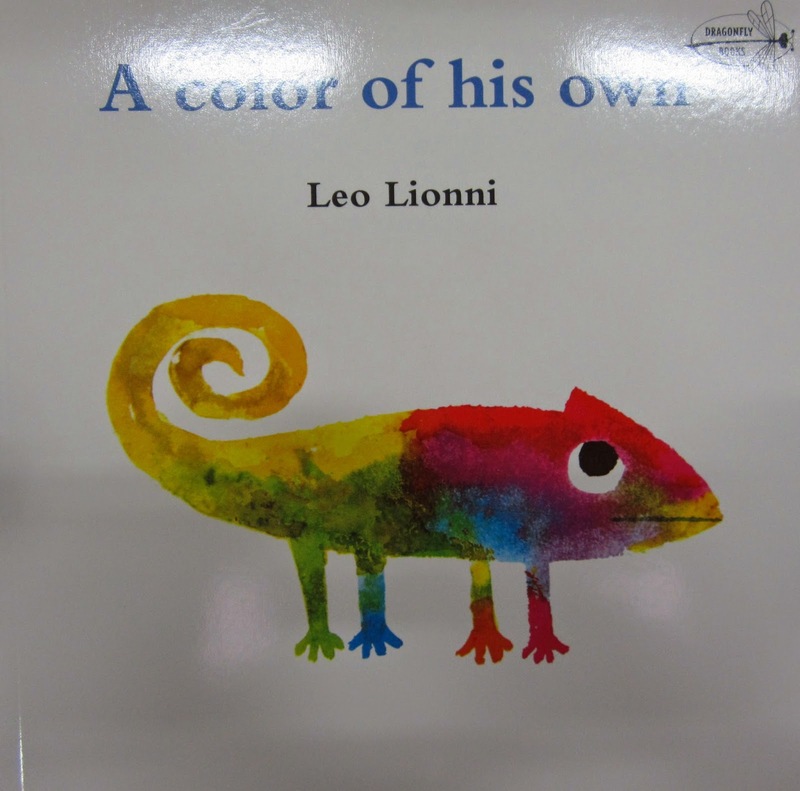 But, your child can mix the primaries (red, yellow and blue) paint together to explore the process. Get out the brushes, pour a few pools of tempera onto a palette (I like to use a sheet of wax paper as an inexpensive alternative) and let your child paint on a piece of poster board. Gather together paper, tissue, clay, paints, crayons, markers and pencils in a few different colors (try to find different shades of each color). Have your child separate them and then make individual color collages. Cut out two fish shapes (using white paper). Have your child pick out a red crayon and a blue one to color the fish! 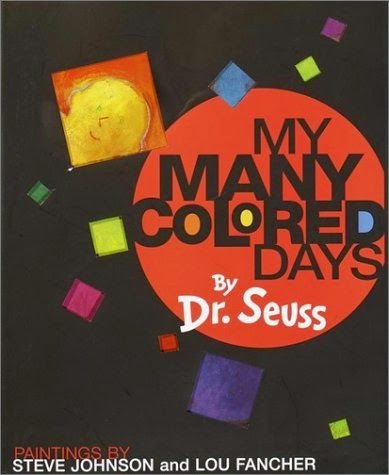 I did this art exercise with preschoolers for several summers while teaching pre-k art classes. Give your child a piece of yarn (if you’re 100 percent sure she won’t poke herself, switch it up for a pipe cleaner). 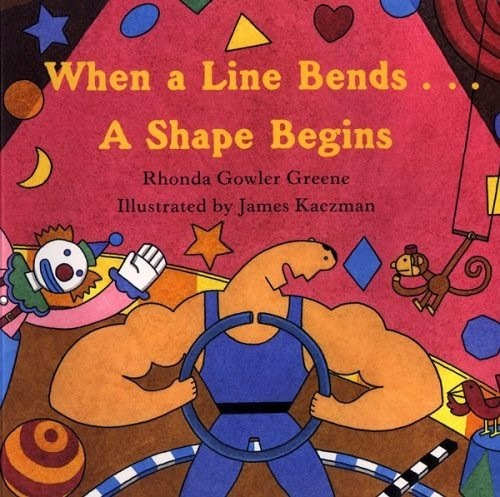 Have her bend it (like the title of the book) into shapes. 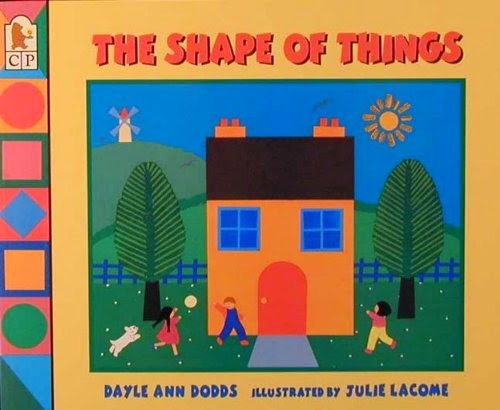 Cut a few paper shapes and have your child collage them together to make a house or anything else that she sees. Use oil pastels to mix colors (your child can blend them with her fingers). She can make a color of her own! Do you want to find a few more creative crafts for your child to try after reading these artsy books? Follow my Pinterest board for ideas! Hi, I'm a children's librarian and blogger and this is such a creative post! I love it! Sharing ... Found you on the Your Modern Family Pin-It Party. It is. Whenever I teach preschool summer art camps, the kids always ask for it. They love it! My kids loved When Pigasso Met Moostise! That is one of my all-time favorites. My son loved it when he was younger and the kids who I teach always get a kick out of it (plus it has such a wonderful lesson about everyone being different and getting along). I’m going to read this. I’ll be sure to come back. thanks for sharing. and also This article gives the light in which we can observe the reality. this is very nice one and gives indepth information. thanks for this nice article... Releases New Children's Book.